Submitted photos Mason Blount, center, stands with his parents on the completed low walk bridge. Blount is the first person in their family to achieve Eagle Scout status. Ben Spiekermann rests for one moment with his father on the low walk bridge over a drainage swale linking the Lovely Nature PlayScape areas. Brendyn Spierkermann, left, assists his brother Ben, working on erosion control along the trail. 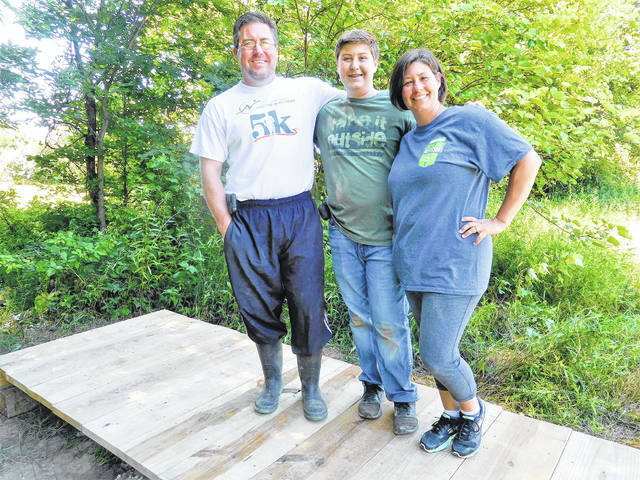 BEAVERCREEK — Greene County Parks & Trails (GCP&T) and several local Eagle Scouts recently completed two projects at Russ Nature Reserve and Karohl Park to increase accessibility for all patrons. 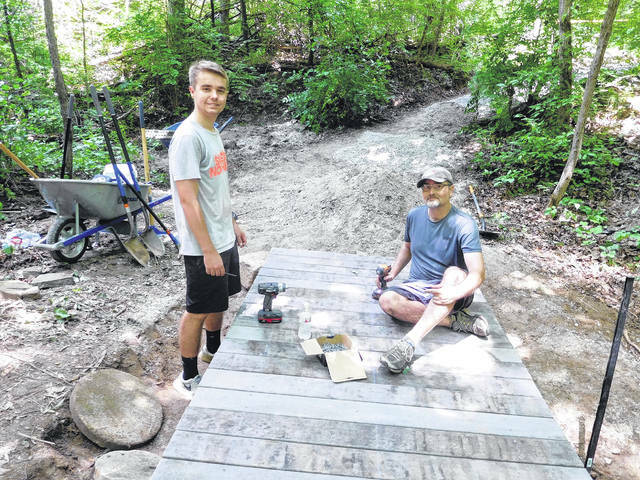 Mason Blount, Troop 162, said he always wanted to build a bridge for his Eagle Scout project and fulfilled that wish by creating a bridge over a wet area within the disc golf course at Karohl Park, 2940 Hohl Drive. Blount supervised a crew of 19 scouts and adults to finish the project. Brendyn Spiekermann completed his Eagle Scout project in 2016 and was assisted by his younger brother Ben. Ben Spiekermann transplanted trees and other tasks earlier this year for Scout community services hours and recently completed a low walk bridge over a drainage swale linking two areas of the Lovely Nature PlayScape. These are just a few recent examples of Eagle Scout projects over the past several years that have increased accessibility at the parks with new bridges, walkways and other construction projects. For more information about any GCP&T site or Eagle Scout project, contact the park agency at 937-562-6440 or visit www.gcparkstrails.com. https://www.xeniagazette.com/wp-content/uploads/sites/32/2018/07/web1_Scout1.jpgSubmitted photos Mason Blount, center, stands with his parents on the completed low walk bridge. Blount is the first person in their family to achieve Eagle Scout status. https://www.xeniagazette.com/wp-content/uploads/sites/32/2018/07/web1_Scout2.jpgBen Spiekermann rests for one moment with his father on the low walk bridge over a drainage swale linking the Lovely Nature PlayScape areas. 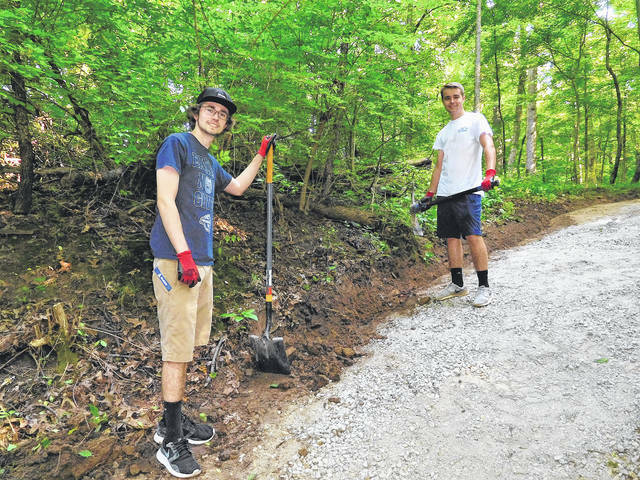 https://www.xeniagazette.com/wp-content/uploads/sites/32/2018/07/web1_Scout3.jpgBrendyn Spierkermann, left, assists his brother Ben, working on erosion control along the trail.